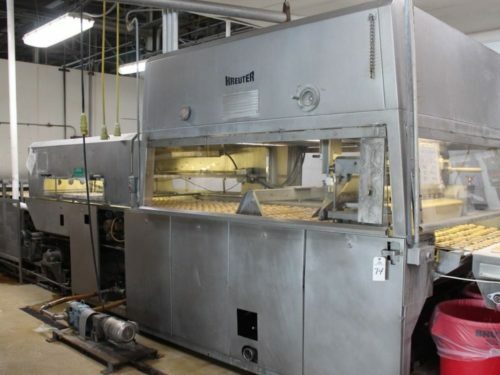 Find a large selection of chocolate enrober machines and equipment for sale, lease or rent. Sollich Model EMM-820, 32" wide, stainless steel top and bottom chocolate enrober with pounds of product per hour – depending on materials and application. Equipped with 32" wide x 72" long product wire mesh product conveyor thru the enrober, with 40" in feed and discharge height, chocolate flow pan and blower operating with in a tolerance of ±1% over the entire width of the machine, overhead heaters and air duct, detailer, shaker, chocolate supply port, product service pan, PD circulation pump, with flip-up safety doors and is hand crank adjustable. Control panel has temperature controller with digital read out, belt speed, blower, top heating and light package, chocolate and supply pump controls with e-stop. Mounted on stainless steel base frame. Stainless Steel, 40" wide, top and bottom chocolate enrober with pounds of product per hour – depending on materials, application and machine configuration. Equipped with a 40" wide x 36" long stainless steel mesh belt thru the enrober, puddle style bottom applicator, waterfall style top applicator, hot air blower, and flip-up safety doors. System includes a positive displacement chocolate circulation pump and self contained water heating system with circulation pump. Frisse, Model UZM421, 16" wide, top and bottom chocolate enrober with pounds of product per hour – depending on materials, application and machine configuration. Equipped with a 16½" wide x 71" long stainless steel mesh belt thru the enrober, (1) 16¾" wide bottom roller applicator, (1) 16¾" wide jacketed top roller applicator, blower, detailer, shaker, overhead heaters with sliding and flip-up safety doors. System includes a positive displacement chocolate circulation pump and self contained two zone 5000 watt water heating system with (2) water pumps. Control panel with push button on/off controls for: agitation, bottom well, vibration, chocolate recirculation pump, chocolate return pump, curtain agitation, blower and detailing. Control panel also includes (3) temperature controls for: water zone 1, water zone 2 and air temperature. WC Smith, chocolate bottomer with cooling table discharge. Equipped with a 16" wide x 50" long Neoprene in feed belt, 16½" wide x 15" long mesh belt bottoming section with 6" diameter applicator drum and 16" wide x 288" long neoprene discharge belt with 84" long self contained cooling table section. Control panel with on / off switches, variable speed control dial and temperature control dial. Used to pre-bottom products before being run through an enrober. Nielsen Model Enrober Jr, 24" wide, stainless steel top and bottom chocolate enrober with pounds of product per hour – depending on materials and application. Equipped with 24" wide x 47" long stainless steel mesh belt thru the enrober, with 38" in feed and discharge height, (2) curtain adjustable chocolate flow pans, blower, detailer, shaker, overhead heaters with sliding and flip-up safety doors. 1-3/4" ID threaded chocolate supply port with product service pan and PD circulation pump. Control panel has temperature controller with digital read out, mesh belt speed, blower, top heating and light package, chocolate and supply pump controls with e-stop. C.E. certified. Mounted on stainless steel (4) leg base frame.